Is there anything worse than a dead child? Killed at the hands of his father? When a soldier is found to have killed his family in a brutal attack, British Army Detective Sgt Major Crane and his team are called in. When they realise there are more children dead on different garrisons, Crane is convinced there is a serial killer at work. But no ordinary one. Can he uncover the connections between the cases, against the odds? And before any more innocents are murdered? You'll love Crane, in this compulsively readable crime novel, because there are twists at every turn. "Crane is a charismatic leading man and is one of the more interesting new genre protagonists I've encountered in quite a while!" Chris Algernon. "A roller coaster ride story." Readers Favourite. Get It This book is only $0.99. Log In to track Wendy Cartmell on eReaderIQ. 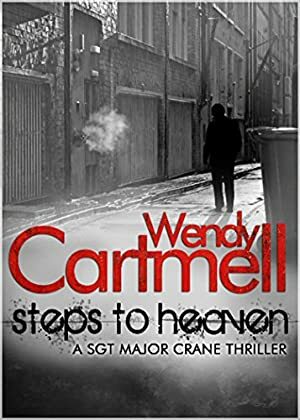 to be notified each time the price drops on any book by Wendy Cartmell. to stop tracking Wendy Cartmell. We started tracking this book on July 27, 2012. This book was $2.99 when we started tracking it. The price of this book has changed 39 times in the past 2,463 days. The current price of this book is $0.99 last checked one day ago. The lowest price to date was FREE last reached on December 26, 2018. This book has been FREE 8 times since we started tracking it. The highest price to date was $2.99 last reached on February 23, 2019. This book has been $2.99 14 times since we started tracking it. We last verified the price of this book about one day ago. At that time, the price was $0.99. This price is subject to change. The price displayed on the Amazon.com website at the time of purchase is the price you will pay for this book. Please confirm the price before making any purchases.